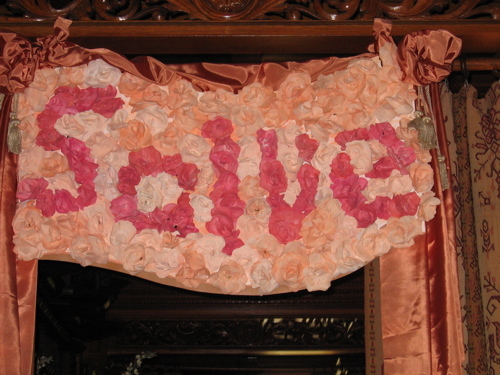 I left my card on a footed porcelain tray under a spray of pink “roses” that spelled out “Salve”, the Latin for “Welcome.” The display would have greeted guests of Maj. and Mrs. James H. Dooley for a reception held in 1906. 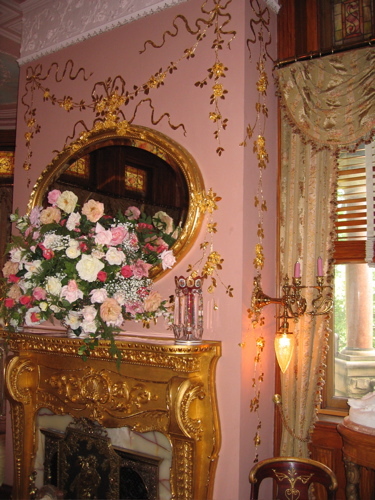 Although made of dyed coffee filters today, I felt no less welcome for my tour of Maymont Mansion, a Gilded Age mansion set in the middle of Richmond, yet so reminiscent of the “cottages” of Newport. 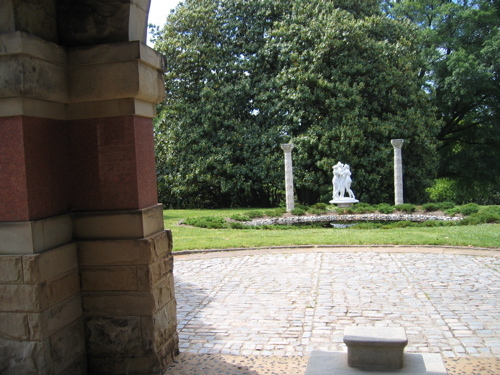 Walking under the porte-cochère and up the steps of Maymont Mansion, you slowly realize that people, some people anyway, really did live like this. The Dooley’s weren’t the Astor’s or the Rockefellers. 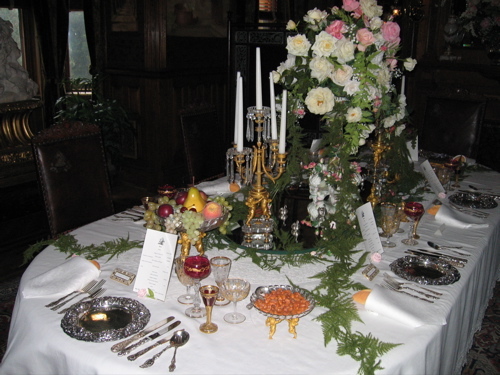 But they did have the social connections that brought the Governors of all the states and their wives to a reception hosted at the mansion; a seated luncheon for two hundred and fifty, on December 7th of 1912. 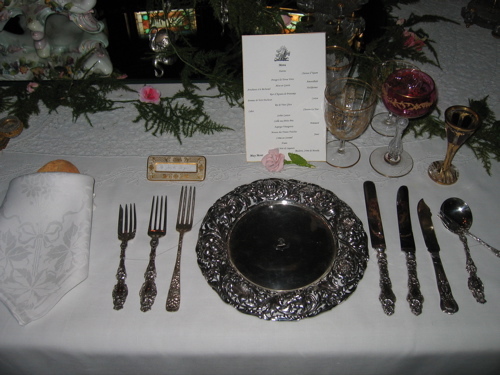 The dining room table was set for an intimate dinner for six with service a la russe. The dinner, as you may be able to see from the menu, is decidedly French in inspiration. 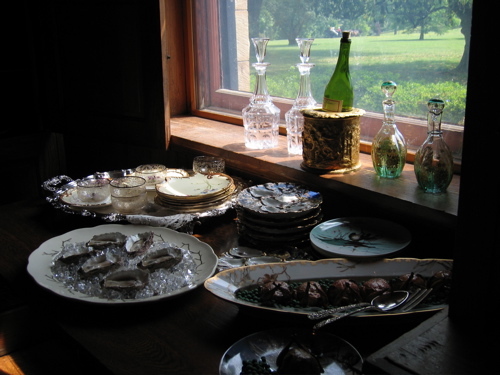 Oysters were served at almost every formal meal, there is a barrel of ice in the cold storage in which to keep them fresh. Stories told by grown-up children who lived in similar surroundings tell of kids feeding corn meal to the oysters. And they say there was no fun before TV. Notice the rolls tucked into the napkins as was the custom. 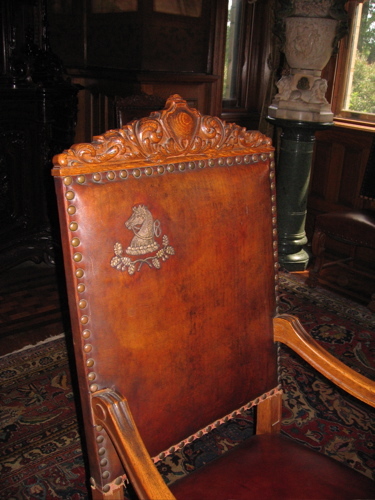 The dining room chairs are covered in saddle leather and embossed with the Dooley crest. 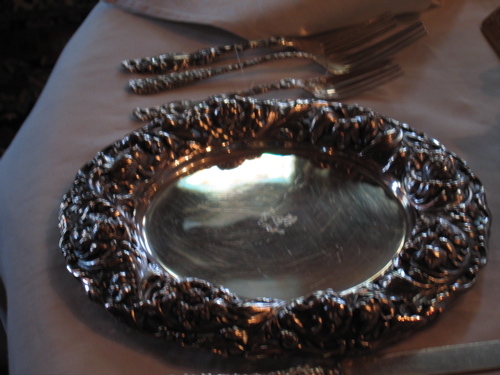 A motif repeated on the silver chargers that were fortunately left to family members who loaned them to the Mansion for the exhibit. 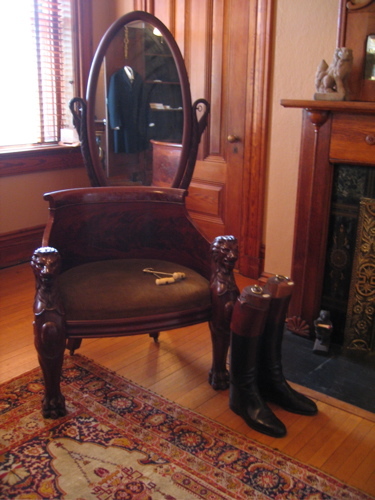 Whist some of the original furniture was sold off, by the City, the upstairs collection of 1,000 objects is 99% Dooley-owned furnishings and works of art bequeathed by the Dooleys. 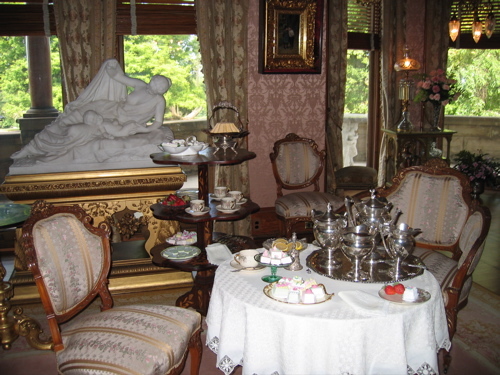 The butler’s pantry is a bit larger than some of the galley kitchens in which I have prepared dinner. 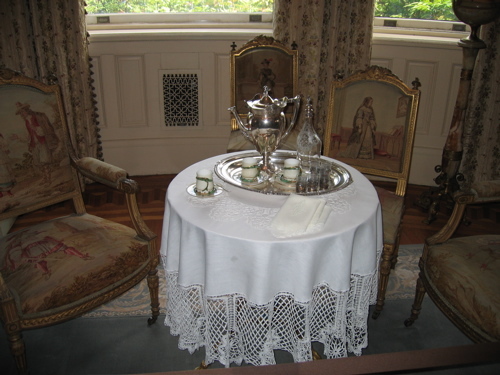 It is still used as a final prep area during the two dinners a year that are given for benefactors. The day I went, we were fortunate enough to have Ms. Dale Wheary, Director of Historical Collections & Programs, take us through the house. 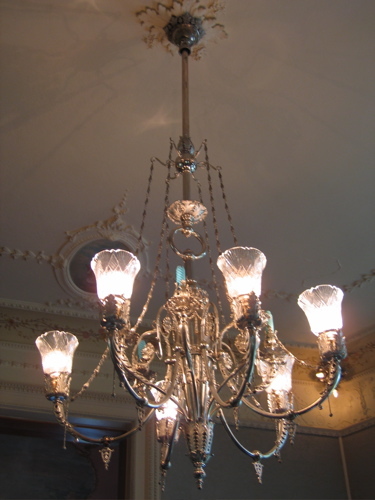 That meant a tour through the upstairs as well as the formal rooms on the ground floor. I wondered where to put the stereo in our house. Maj. Dooley had to be concerned with the placement of the band. 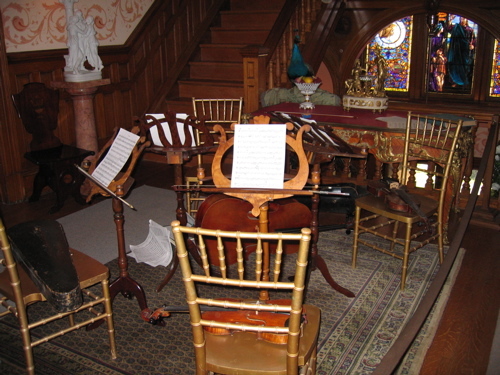 I stood on the landing and looked at Tiffany glass windows and imagined the band from The Jefferson Hotel playing for the guests below. Maj. Dooley was reported to have been the ideal employer, greeting band members by name and distributing cigars at the end of the evening. 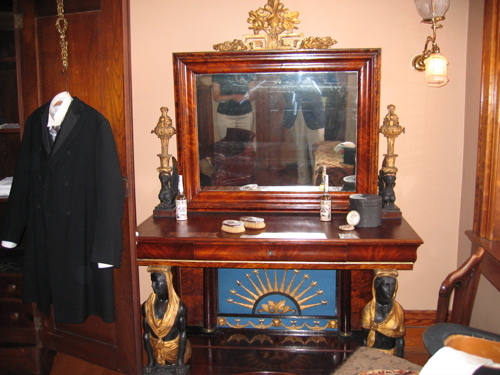 His dressing room is small, but neatly appointed with a very nice bureau and brass summer doors on the fireplace. 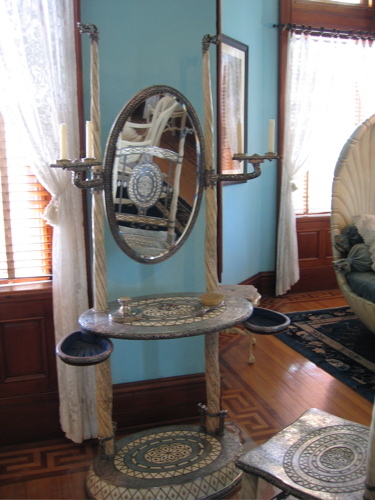 But it is Mrs. Dooley’s room that will stop you in your tracks, if only because of the Tiffany silver and narwhal vanity and the swan bed brought back from their summer cottage, Swannanoa. The vanity was made after the discovery of Viking ships around the time of the great expositions. This one was supposed to have been displayed at The St. Louis Exposition (1904). 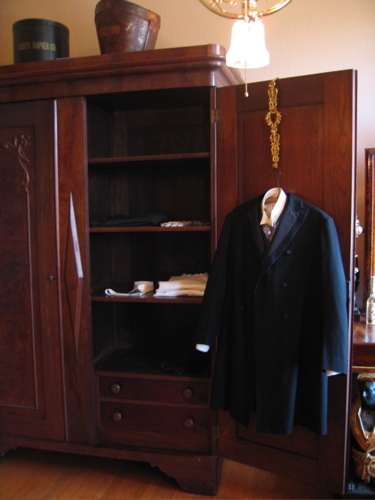 the style was made until 1905. An enviable existence to be sure. 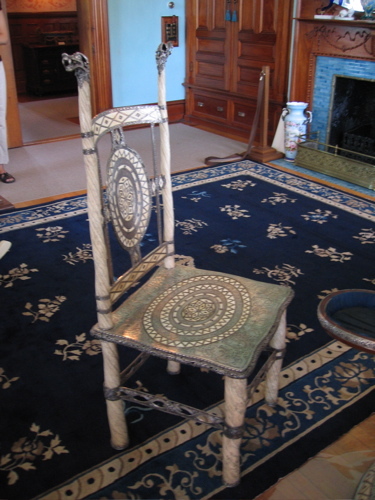 And one that is on display to the public. If you are in the neighbourhood, do stop in, take an easy stroll through the Japanese and Italian gardens and pay a call on the mansion itself to visit both above and below stairs. 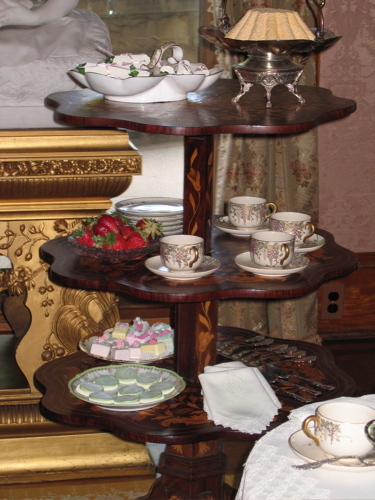 You will be greatly influenced by the orderliness, the elegance and the civility of a world long gone, but still very much in evidence in Maymont Mansion. 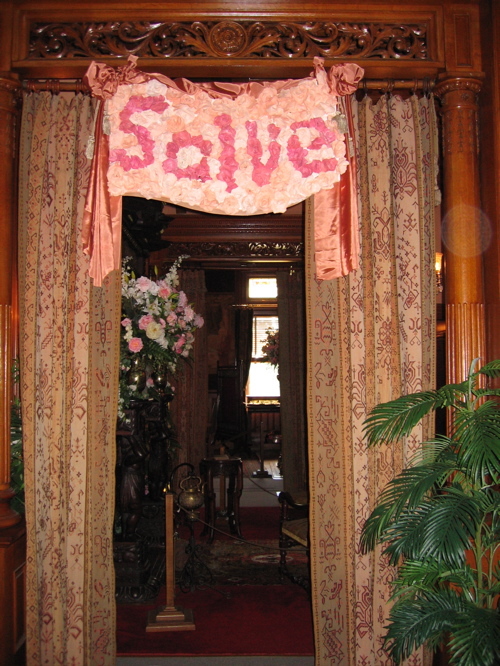 This entry was posted in Cultivating, Living and tagged Gilded Age Mansions, Maj. and Mrs. James Dooley, Maymont Mansion, Richmond VA, Swannanoa Mansion, Tiffany Windows. Bookmark the permalink. I love touring homes like this! What a dinner menu! Anything that STARTS with a Chateau d’Yquem just sings to me. Great post. Thanks! What a great post. Can you imagine the staff required to pull off living on this scale? I can only dream. Fascinating menu. Typical of the times, starting with the very sweet d’Yquem with the oysters, and ending with champagne (which would certainly have been much sweeter than what we are used to today). That is amazing. Great photos. It looks like an incredible place. A lovely post and a most timely tour for the book I’m currently reading and highly recommend. “The Bolter” by Frances Osborne on the life and times of Idina Sackville, who personally left her imprint, scandalous though it was, on the gilded age. I hope to do a post on it at some point, but I found the whole way of life to be a true marvel of insouciance and practicality. Which brings new meaning, one might suspect, to the swan bed. eA, or “swanning about….” Bought the book for Mrs. E. . She’ll get to it next, I believe. What a lovely tour. Merci Beaucoup! I really didn’t have time to read this article today, nor take the time to comment, but I was drawn in and loved it so much that I felt is was time well spent. 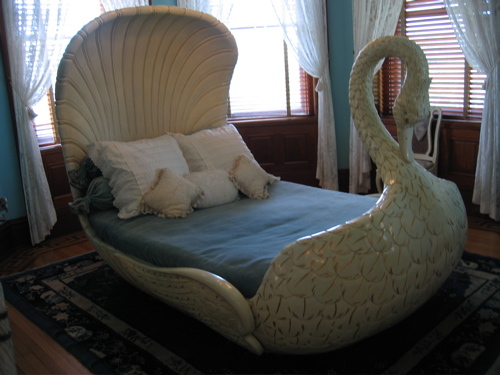 The swan bed was shocking and charming in an odd Edwardian way! Thank you! I find this house to be very “over the top” and lacking in good taste. Why would two people with no children need 33 bedrooms? This is complete greed and self indulgence. It is apparent that they had no spirituality along with being completely materialistic. Why do people admire such worthlessness? I will never understand. The dooley’s were a complete waste of space in their lifetimes. I only hope that they learned something when they went on to the afterlife. I realize that jmarple posted 6 months ago but I couldn’t help but say something about his/her judgemental comments made obviously out of ignorance. 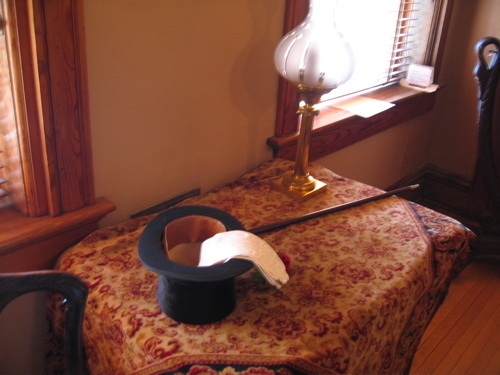 Dooley Mansion is very small with only 3 bedrooms on the second level, not 33. There aren’t 33 rooms in the entire house! 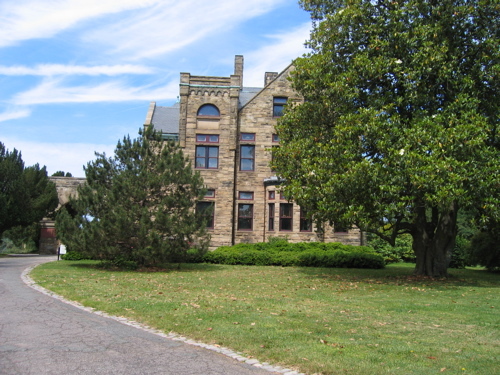 Maj. & Mrs. Dooley were generous benefactors of the city of Richmond, providing funds for a variety of charities as well as a public library and ultimately donating their property which today is a beautiful park enjoyed by all of Richmond. I only hope, jmarple, that you are as generous to your fellow man as the Dooleys, in order to balance your judgemental attitude. Jmarple, even though they didn’t have any children, they still had their niece and nephew to come and enjoy the mansion. 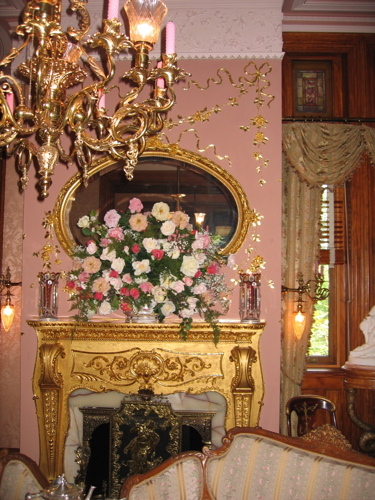 I am fortunate enough to just so happen to be the great grand daughter of the niece that often spend her summers at the mansion. 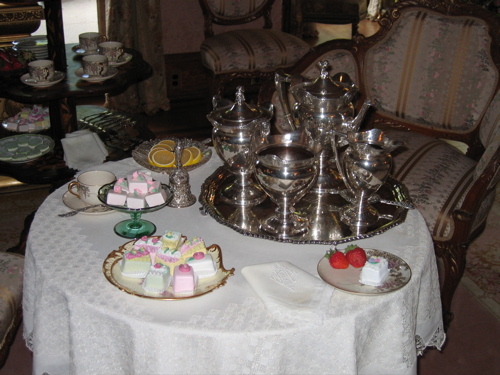 Not only did they enjoy the mansion, but now Richmond Virginia also gets to enjoy the beauty of the premise They decorated their house to their taste and what they enjoyed. After all, wouldn’t you want to enjoy your house to your taste rather than just off of what other people like?